The Mercedes-Benz Superdome is arguably the state’s most recognizable landmark. 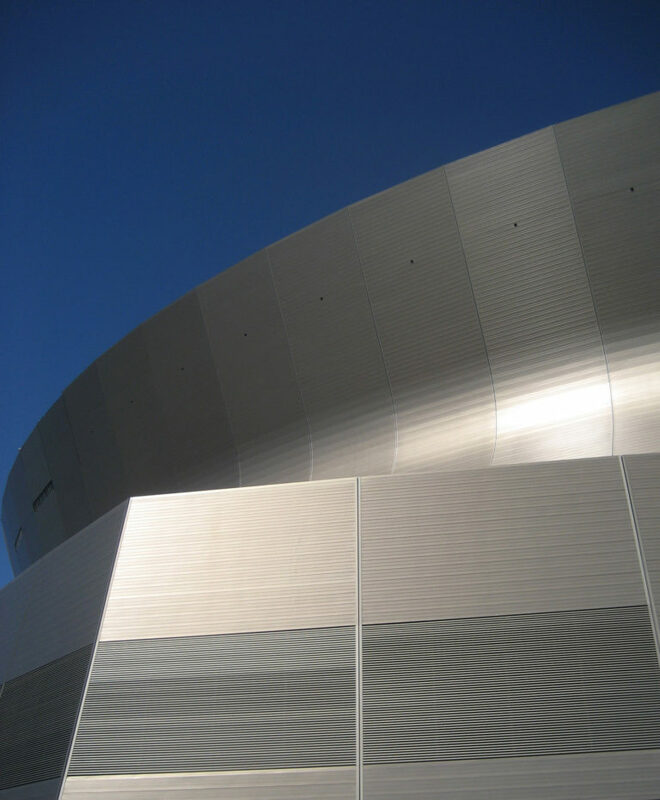 Shortly after Hurricane Katrina in 2005, Trahan Architects was selected to be the lead architect and managing partner of the team that restored the iconic Superdome on an accelerated schedule, allowing it to reopen on September 25, 2006, under budget and ahead of schedule with a total cost of over $200 million dollars. Phase I included replacing the outer surface of the entire 9.7-acre roof, installing a brilliant new video board-scoreboard-message board system, completely remodeling 38 permanent concessions stands and all three kitchens, and upgrading 8,000 Club Level sideline seats and 4,000 Box Suite seats. Phase II began after the 2006 football season and included finishing all 137 stately suites and four Club Lounges, adding new windows in the Lounges, installing new state-of-the-art technology infrastructure throughout the building, and completely upgrading the Superdome’s in-house TV production facilities. Hurricane Katrina caused more damage than any other natural disaster in U.S. history. The storm cost an estimated $250 billion dollars in total physical damage as well as economic impact to the city. During the storm and its aftermath, more than 770,000 residents were displaced from the city. The restoration of the Superdome was a monumental feat completed in approximately 8 months. As estimated 3.8 million gallons of water as well as 4,000 tons of debris and trash were removed as part of the renovation. On August 29, 2005, the worst natural disaster in U.S. history, Hurricane Katrina, brought New Orleans to its knees. The effects of this devastating storm were personified by the damage inflicted upon the city’s largest, most recognizable icon, the Superdome. It came to serve as a “Refuge of Last Resort” providing shelter for more than 30,000 New Orleans citizens for six long days. Ultimately the Superdome is responsible for saving the lives of countless New Orleanians. The restoration of the Superdome was an unprecedented endeavor into structural ingenuity. At a total cost of $336 million, the project was a testament to the determination, willpower and dedication of all the individuals involved. The $32 million roof job—billed as the world’s largest—was completed in the 144 days, nearly 40 days ahead of schedule. The stadium went from Katrina’s destruction to “football ready” in only 13 months. In the wake of tragedy, a broad coalition—including the Superdome staff, State of Louisiana, NFL, New Orleans Saints, and construction crews—came together to accomplish one goal: to open the Superdome with a Saints football game on September 26, 2006. At the peak of construction, there were over 850 people working tirelessly around the clock. The rebuilding effort signaled to the world that the New Orleans recovery was underway. On September 25, 2006, a sellout crowd witnessed the New Orleans Saints’ “homecoming” triumph over the Atlanta Falcons 23-3 on ESPN’s Monday Night Football. It was the Superdome’s post-Katrina debut, and one of the most emotionally powerful games in NFL history. Steve Gleason’s blocked punt resulted in a touchdown, and showed the world we were back. Against the odds, the Superdome has reclaimed status as a world-class venue for sports and entertainment. Just like the spirit of our people, the Louisiana Superdome now rises as a sign of hope and promise. We have accomplished this feat because of strong leadership, strategic planning and hard work. And we honor you as we celebrate this unprecedented accomplishment… I am in awe of your effort. You are the true heroes of this project. As part of the renovation, the entire 400,000 sf of aluminum panel exterior skin was replaced. The new anodized aluminum panels were designed to look, in shape and color, like the original 1975 Curtis & Davis design, but will outperform the original metal skin in terms of its structural capabilities, air and rain infiltration, and insulation values. The hurricane badly damaged over 30 percent of the exterior skin in random places. The way the building was originally designed, removing one panel necessitated removing everything above it as well, so replacing only damaged panels was not an option. The new panels are affixed without rivets, so that if a single panel is damaged it can be replaced without affecting the adjacent panels, allowing for better maintenance throughout the life of the building.